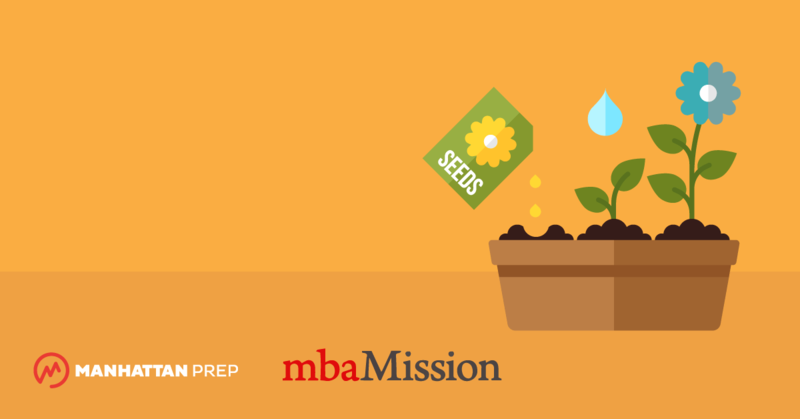 At mbaMission, we strongly advise MBA candidates to start the application process early by using the months preceding the release of applications in June and July to get organized and to proactively take steps to competitively position themselves. Here we present a rough business school timeline for the entire MBA application cycle to help candidates better manage the process so that all opportunities are maximized. The earlier you begin studying for the GMAT/GRE, the more time you will have to absorb important concepts and master test-taking skills, of course, but you could also spare yourself much of the strain and chaos involved in juggling multiple aspects of the application process (e.g., essays, class visits, supplementary coursework) at once, later in the season. So, now is the time to begin your exam prep and thereby remove—or at least minimize—this time-consuming and potentially stressful element. We strongly recommend that you enroll in a Manhattan Prep course in March (April at the latest) so you will have time to complete a nine-to-ten-week preparatory course and take the exam for the first time before the application season begins. If you feel you might benefit from some additional coursework, enroll in classes now. If your undergraduate performance was weak (a GPA of 3.0 or lower) or you completed little-to-no quantitative coursework at all, despite otherwise performing well, you should identify nearby colleges and inquire about their available introductory course offerings in areas such as economics, accounting, finance, and statistics. By taking one or two classes in these areas, you could bolster the admissions committees’ impression of your academic aptitude and ability to handle an MBA curriculum. By enrolling now, you should have ample time to complete a semester-long class and have any academic “problems” solved by the end of summer at the latest. As you work to identify what will eventually become your list of target schools, look beyond the popular MBA rankings and consider visiting the campus of a few programs that interest you to learn firsthand about what they offer, their differences, and how they fit your personality, interests, and needs. (In addition, admissions committees generally appreciate when prospective students visit, and your time on campus will enable you to better describe your fit with the school via your essays.) Most MBA programs will facilitate class visits into mid-April, and by scheduling these visits now, you will be able to complete—and thus eliminate—this time-consuming aspect of the application process that would otherwise demand your attention as Round 1 deadlines approach (most schools open their class visit schedules in October). Start focusing now on accelerating the timeline of any endeavors or goals you have been actively pursuing. For example, if you have been intending to publish a certain article and are close to completing a final draft, then do the work necessary to finish it sooner rather than later. If you have been working toward earning your CFA designation and have only Level III of the exam left to pass, then be sure to take the final test this year. If you can run 20 miles and have been dreaming of completing a marathon, do it this year. We are not suggesting that if you have never run a mile in your life, you start training for a marathon now, but if you are close to achieving a goal and would likely do so naturally after your applications are due, accelerate your timeline to ensure that you have completed it before the schools’ Round 1 deadline. One way many candidates reveal more of their leadership potential and differentiate themselves from others is by taking a leadership role in their community. The earlier you take this step, the more time you have in which to create a track record and show that you are a substantive individual outside of the office. If you instead wait to start volunteering until the fall, your contributions will seem far less sincere, and you will not have sufficient time or opportunity to have the kind of profound experiences that lend themselves well to application essays. When identifying a volunteer activity in which to involve yourself, first and foremost, select an organization about which you feel legitimately passionate. If you are genuinely excited about the cause or organization you have chosen, you will be more committed to it, enjoy a more meaningful experience, and have a more heartfelt story to tell about it. If you plan to remain with or return to your current firm after you graduate from business school, do some research now to learn whether your company will sponsor part of all of your MBA. Firm sponsorship obviously confers financial benefits, but it also offers some additional power with respect to admissions. The schools know that company-sponsored candidates will be employed upon graduation and that their post-MBA goals are thereby “guaranteed,” which improves their attractiveness as applicants. However, securing firm sponsorship can be a timely process. We have worked with clients who have needed to apply for such scholarships 1.5 years before their proposed programs would begin, and you obviously do not want to be applying at the last moment if this is the case at your firm. Similarly, we have worked with clients whose companies did not originally have sponsorship programs but created them when the candidates brought forth the idea—a process that can take months of bureaucratic haggling. So, this is certainly a task you should undertake now. Another way to gain a deeper understanding of your target schools is by meeting with alumni or students, and you can begin doing this now as well. Students may be able to bring specific programs and classes to your attention that are not prominently featured on a school’s website or in its marketing materials but that may be quite appealing and/or relevant to you. Referring to such resources and offerings may also help you strengthen your case for attending that particular school. By meeting with students and alumni and by visiting classes, you will collect a variety of data points that will serve as a foundation for you to persuade the admissions committee that its school is ideally suited to you, in a way that few other candidates will be able to do. We will assume that you understand that community leadership and advancing personal achievements should be conducted on an ongoing basis throughout the admissions season. However, because the schools will not be tracking your hours from week to week, you can dedicate yourself heavily to these activities in the early months and then, as your time demands become more intense in August and September with various application responsibilities, you can shift your focus to other aspects of the application process. At this point, start identifying your potential recommenders (even if you do not actually approach them about the task for several more months) and gathering intelligence on each of the individuals you are considering. We find that one of the most frustrating parts of the application process for candidates is connecting with and motivating recommenders, so the more time you give yourself for this task and the earlier you begin, the better. Strive to find out whether your recommender has written letters for anyone else and whether he/she tends to generously dedicate time to employee feedback and review sessions. One of the best windows into your possible recommendation process with an individual will be the previous experiences of others who also called on that person for assistance, so you may want to speak with these earlier applicants to learn about what their experience was like. By identifying recommenders who will be helpful and supportive, you will potentially alleviate the stress of missed deadlines and unpredictable letters. Similarly, take time to reconnect with previous supervisors who could be strong potential recommenders but with whom you may have fallen out of touch. You do not want to be in a position where you are calling a former supervisor for the first time in a year and asking him/her for a large chunk of time on a tight timeline. If you identify someone whose time you expect to need, make contact now and keep the relationship alive over the next few months. By doing so, you will be in a much better position when the times comes for your recommenders to begin letter writing. Taking the GMAT/GRE by June is ideal, because doing so allows you to finish one major component of the process just as another—starting to draft your essays—looms on the horizon. Furthermore, if you take the GMAT/GRE in June and do not do as well as you had hoped, you have sufficient time to take the exam again. Many MBA admissions committees even encourage candidates to take the exams more than once. Your scores will not be averaged; instead, the programs tend to, forgivingly, take the higher (or highest) of your scores. Prepare your resume now so that come October, during the latest stages of the application process, you will need to make only small modifications and updates regarding your most recent position, if necessary. By working on your resume now, you can give it your full attention, without the distraction of essay writing. Further, because the activity naturally requires you to reflect on your skills and accomplishments, this will remind you of certain meaningful experiences and achievements. In this way, preparing your resume can be an invaluable stage of the brainstorming process for your essays, so that when the schools begin releasing their questions, you already have some clear ideas for strong narratives you can use. As noted earlier, the GMAT/GRE may not go as well as you had hoped on your first attempt. But do not worry—if you did not achieve the score you wanted, simply prepare now for a stronger second attempt. Candidates must wait one month before they can retake the GMAT and 21 days before retaking the (online) GRE, so a test in July would likely be the next available option. If you do need a second shot at the GMAT/GRE, schedule your next session immediately, while the information is still fresh in your mind. Virtually every business school requires that candidates write an essay that discusses their short- and/or long-term career goals, which means you should expect to need to articulate your post-MBA aspirations. If you hope to enter a competitive field, such as banking or consulting, now would be a good time to conduct informational interviews or even job shadow an individual for a day, if possible. The admissions committees frown on vague goal statements or generic claims that lack a profound personal connection to a position and are therefore less credible. By connecting with and learning from people in the position and/or industry you are targeting, you will gain insight that will imbue your stated career goals with sincerity and authenticity. By mid-July, typically, most MBA programs will have released their essay questions for the coming year. So at this time, you should pare down the list of schools you have been considering and determine which ones will be your target programs—the ones to which you will apply in Round 1. Although we generally recommend that MBA aspirants apply to four to six schools, including a mix of safe, competitive, and reach programs, do not sacrifice quantity for quality—apply only to the number of schools to which you can commit yourself entirely. A core truth about essay writing is that you cannot turn a bad idea into a good essay. At mbaMission, we insist on taking our candidates through a lengthy brainstorming process (beginning with a thorough questionnaire) to discover the stories that make each applicant distinct. As you uncover your stories, you must also consider them from as many different angles as possible. For example, coaching a baseball team at an underfunded high school can be a story about creatively motivating an underachieving team and changing attitudes, despite losses; or about initiating and leading fundraising efforts so that each player can afford proper equipment; or about mentoring a struggling player and seeing an improvement in his on-field performance. Your essays will be only as good as your ideas, so do not settle for just the most obvious anecdotes that readily come to mind—dig deeper to find options that will help distinguish you from other applicants. At this point, you should have completed your supplemental coursework and earned an A grade (or multiple As, if you took more than one class). Schedule opportunities to meet with your chosen recommenders to discuss their important role in the application process and to review your major accomplishments with them. This will ensure that these elements are fresh in their minds when they start to write about you and your achievements. Such meetings are not only appropriate but are even recommended by a number of admissions directors at the top schools, and of course by us at mbaMission. Although recommenders should write their letters independently, candidates who meet with their recommenders before the writing begins have an opportunity to remind these individuals of long-forgotten stories and accomplishments, thereby helping ensure that the resulting letters are sincere, personal, and powerful. Writing standout essays takes real time and patience. We recommend that you really immerse yourself in the process, because it is the foremost avenue by which you can differentiate yourself from other applicants. By devoting the time necessary and writing about your experiences with sincerity, you will give the admissions committee a better sense of who you are and what makes you special. Share your essay drafts with one or two people you trust to give you honest feedback—if possible, a professional consultant or someone with insight into the application process—but limit your feedback loop thereafter. Because the application process is subjective, the more people you involve, the more opinions you will receive, and if these opinions differ markedly, they can create unnecessary uncertainty. We are not suggesting, of course, that you ignore critical feedback, but take care not to complicate the final days before you submit your application by creating doubt where it may not be due. If one or two readers support your ideas and feel that your application needs minimal work, you are probably best off ending your feedback loop there and submitting your application. The short-answer sections of the MBA application—the portions of the forms that pertain to your work history, community accomplishments, scholarships, and other such criteria—should be completed with the same spirit of diligence that candidates ideally bring to all aspects of their applications, yet many applicants choose to postpone addressing these “details” until the last moment. As a result, some applicants miss the opportunity to put their best foot forward with these seemingly simple elements. By working on them now, however, you can avoid an enormous headache later and increase the likelihood that you are providing more thoughtful, complete, and effective answers. Furthermore, as with updating your resume well in advance, you may discover stories in the process of completing these sections that will prove quite useful when you are later writing your essays. Unfortunately, many recommenders tend to not make writing recommendations a priority and will wait until the last minute to craft these letters, leaving the MBA applicants to worry about whether the recommendations will ultimately be submitted before the school’s deadline. The best way to improve your chances that your recommenders will complete this important task on time is to present them with your own deadline, which is earlier than the school’s. For example, if the application to your chosen program is due October 10, tell your recommenders that you plan to submit your application on September 30. This way, even if your recommenders end up being a little “late” with respect to the date you stated, you should still be able to obtain their letters in time for the MBA program’s required deadline. As the Round 1 deadlines approach (typically in the first two weeks of October), do whatever you can to submit your best work, but once your application has been submitted, shift your focus to letting go and trying your best to be patient. If you realize later that your application included a typo or some other minor error, this would be unfortunate, but it is not a reason to panic. The admissions committees are not looking for reasons to reject you but are seeking to get to know you through your files. So, press submit, and start looking forward rather than back. As we noted earlier, having firsthand experience with a school is crucial in that it allows you to get to know a target MBA program much better and to more easily make a case for your fit with the school. If you have any additional schools that you intend to visit, you can ideally do so before their Round 1 submission date, so that you can learn from your experience and apply your learning to your applications. With Round 2 application deadlines only nine or ten weeks away (typically in early January), now is the time to get started on the applications for your next few target schools. Most candidates are typically admitted in the first two rounds, so completing any remaining applications by the Round 2 deadlines should be your goal. Good news—you have been invited to interview! Your interview may occur on campus with a student or member of the admissions staff, or it could be somewhere in your area with an alumnus or alumna, but neither kind of interview is better than the other, and admissions committees consistently reassure candidates that all interviews are weighed equally. To prepare for this important meeting, start by reviewing your entire application in depth, paying particular attention to the stories you presented in your essays. Be sure to reexamine your reasons for targeting the school in question and get comfortable speaking out loud about your short- and long-term ambitions. In short, your goal is to be ready to engage in a thoughtful conversation, with anecdotes that highlight important aspects of your personality, capabilities, and experience. By December, Round 1 decisions will start to be announced. Some schools release them all at once online, whereas others slowly alert applicants to their fate over a period of a few weeks, via phone calls or online. If you have a friend who receives a decision and you are still waiting, do not panic—and definitely avoid the temptation to call the admissions office and ask whether a verdict has been reached about your candidacy. Admissions personnel are easily frustrated by such calls and will not give you the answers you seek. Sit back and try to be patient. We hope that by now, you are weighing multiple offers. If you are not yet confident as to which program to select, perhaps another campus visit is in order. You have the opportunity at this point to really spend time getting to know your target schools even better and completing diligence that may not have been possible before. For example, as a nervous applicant, you may not have truly pushed the students you met to discuss a program’s weaknesses or thought that delving too deeply into the recruiting situation on campus was not appropriate. Further, you may not have felt comfortable experiencing the social environment on campus, preferring to maintain a profile that was strictly professional. Although attending “welcome weekends” will help you get to know your future classmates, visiting (or revisiting) campuses now—while classes are in session and the schools are operating as they will the next year—will provide you with insight that will facilitate one of the most important choices of your life. Some schools make their financial aid decisions based on the information contained in candidates’ applications, while others have additional applications that applicants must prepare to be considered for such funds. If you have been accepted to two or more programs, you can actually—if you do so diplomatically—leverage the financial aid offer you received from one school to influence the funding decision at another. If you make your request in too forceful a manner, however, you will only alienate the financial aid office, and they may choose to not offer any additional resources to help influence your decision to attend the other school in consideration. So, tread carefully and judiciously, and you might just reap some unexpected rewards.